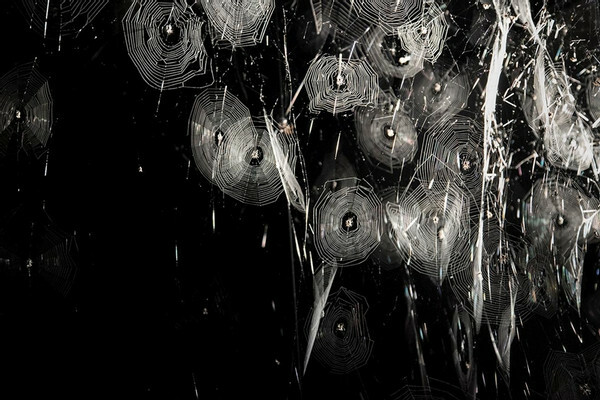 The Museo de Arte Moderno de Buenos Aires, governed by the Ministry of Culture of the City of Buenos Aires, is proud to announce the opening of Tomás Saraceno: How to Entangle the Universe in a Spider Web, the first exhibition at an Argentine museum by Tomás Saraceno (b. 1973, San Miguel de Tucumán; lives and works in Berlin). Curated by Victoria Noorthoorn and the team at the Museum, the exhibition will present two immersive installations deriving from a decade’s worth of interdisciplinary artistic research. Combining Saraceno’s interest in arachnology and astrophysics, with sound and the visual arts, the project introduces museum visitors to a collective "cosmic concert" that envelops the two spaces. Suspended filaments of websand swirling formations of dust foreground a floating journey through the cosmic web—an analogy commonly used by astrophysicists to describe the universe as a set of discrete galaxies that are joined together by gravity. In the installation The Cosmic Dust Spider Web Orchestra, visitors find themselves part of a rhythmic ensemble. A beam of light illuminates a cloud of cosmic dust, as its augmented presence is projected in a dimly lit room. A number of cameras live record the position and velocity of the particles, as they travel through space, transforming them into notes of sound that are reproduced in a set of loudspeakers spread out across the gallery space. The frequencies produced by the elements in this composition are conveyed to a spider web, at which a spider is plucking. The vibratory movements produced by the spider in its web, are amplified through a loudspeaker that is positioned below the beam of light. The reverberation animates the particles, causing fluctuations and collisions. The interaction between the spider and the cosmic dust is expanded by the presence of the visitors in the gallery, whose movements generate new variations in this ecosystem. The installation Quasi-Social Musical Instrument IC 342 built by 7000 Parawixia bistriata – six months, features the largest three-dimensional spider web ever exhibited. As visitors wander through shiny filaments, galactic clouds appear as extended ripples of a micro- and macrocosmos of cooperation. Interconnected threads woven by thousands of quasi-social spiders from the South American species Parawixia bistriata surround the visitor. The teams working in the project have adapted to, and learned from, the temporalities of the Parawixia: from the way it weaves, to the way it groups and expands. During several months, the spiders wove exceptional, long silk sails, bridging from, and anchoring onto the architecture of the gallery, challenging visitors’ perceptions of the very nature of "being" and "becoming" in the cosmos. How to Entangle the Universe in a Spider Web by Tomás Saraceno expresses the artist’s idea of the universe as an extensive realm of interconnections. It also reconsiders the affinities that exist beyond the human realm, like flows on the atmospheric wind, and journeys through the cosmic web. Immersed in an infinitely complex web, visitors become a part of a social construction integrated by the arachnids, the artist, the curators, the professionals from different museums, the scientists, and the thinkers from different disciplines who have worked on this project. Multiple forms are created as a sequence of trails, traces and constellations that reveal the microscopic, the global and the cosmic. The exhibition is jointly organized by the Museo de Arte Moderno de Buenos Aires and Studio Tomás Saraceno, with the collaboration of the Museo Nacional de Ciencias Naturales Bernardino Rivadavia. It was made possible by the support of the Council of Cultural Promotion of the City of Buenos Aires.